Can Psychometric Assessments help me find the right person for the job? Choosing the right person for the job has long been a problem that many employers have struggled to address. Poor selection may have disastrous consequences for both the employee and the organisation. From the organisation’s perspective, the cost of hiring and training an inappropriate candidate can be very high in terms of lost productivity and revenue, reduced efficiency, increased absenteeism, reduced morale, the cost of the selection process itself and the cost of retraining new personnel. From the employee’s perspective, being selected for the “wrong” job may have consequences ranging from loss of motivation, reduced job satisfaction, increased work stress, failure to progress in their career, to more clinical manifestations such as depression and anxiety. Employers have attempted to resolve the selection problem by using a variety of methods to aid selection accuracy. However, over the years many of these have been “faddish” and lacking in predictive validity. Today, methods such as hand writing analysis, astrology and reliance upon written references (that inevitably praise the candidate) have given way to more valid methods. Numerous studies have shown that modern psychometric assessment is one of the most valid predictors of future job performance. 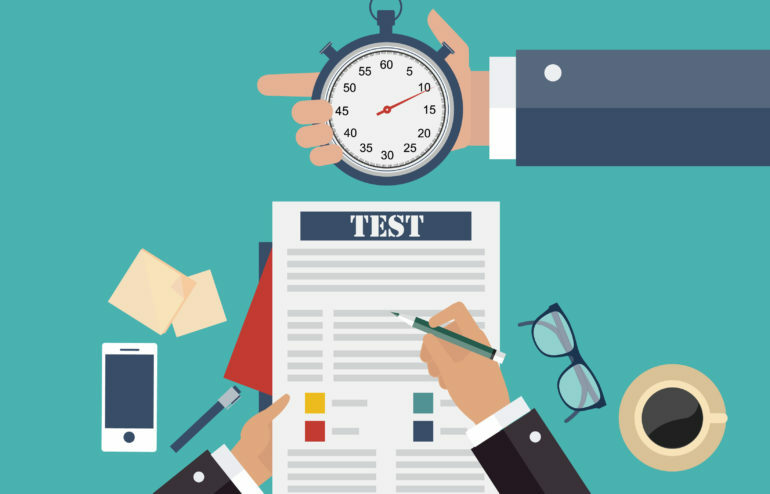 With increasing frequency, employers are now turning to psychometric testing to aid in selection decisions as well as evaluation of personnel. Objectivity – good psychometric assessments are standardised on a large sample and provide normative data across a wide range of demographics and age cohorts. Well selected tests will allow you to demonstrate talents that may otherwise not be evident. Validity – psychometric assessments are a more valid method than interviews, academic achievement & reference checks, and when utilised in combination (for example in an assessment centre) are highly predictive of future job performance. Cost – the cost of selection errors is large for both the employer and the employee. Psychometric assessments help to minimise costs while maximising potential fit between the candidate and the job. So what exactly is psychometric assessment? A tool to aid in the candidate selection and decision making process. Psychometric tests do not and should not stand alone as the only selection method. Psychometric tests are carefully developed for specific purposes and need to be utilised for the purpose for which they were intended. The tests used in the selection setting are purpose designed to help fit your talents, personality and attributes to a job that suits you. They are not designed to reveal your innermost secrets or uncover confidential information about you. Reputable tests have undergone rigorous research before being released, and published technical manuals provide research evidence of their reliability and validity for specific purposes. Caribbean HR Solutions are proud to be a provide support with Psychometric Assessments and all other support for your hiring needs. For more information contact us at 1-876-971-7632 or email us at sales@caribbeanhrsolutions.com. Having worked with many Hiring managers across different functions I have seen that most of them, especially new managers are not comfortable in interviewing candidates. Bringing the best people onto the team was always on top of their mind, yet not having the key talent assessment skills gets them in trouble in establishing the best team. I must say, some of them got the help of HR to do a collaborative interview with the candidate. So HR can focus on the people side of it, understand the right fit by asking behavioural questions and measuring things that are linked to the culture fit. And Hiring managers can focus on asking those questions that are job oriented and measuring competencies that are required for the success of those positions. 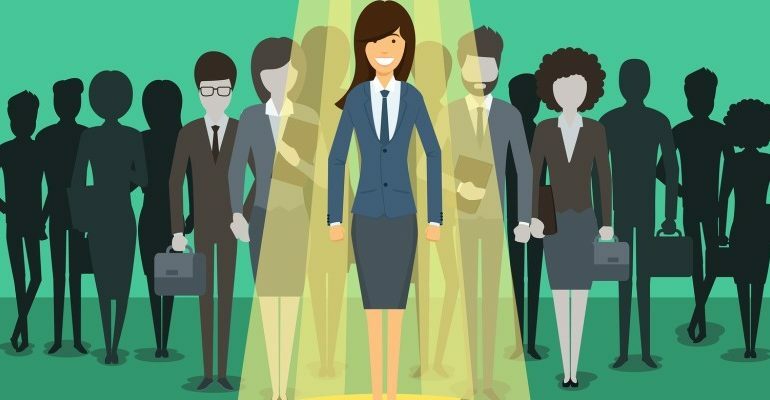 But eventually, they knew In order to make a great hiring decision and become a successful hiring manager they need to master the key Talent Assessment skills. Focus on what really matters the most. And here are those! It is easy to check the box and know that candidates have all the skills required to do the job. Most managers focus on skills and competencies because they want somebody to be onboard immediately without spending much time and investment in training or mentoring. Forgetting the fact that in the long run the future needs of a business could be different and the skills and experience that you focus currently might become obsolete tomorrow. A successful hiring manager knows that skills can be taught and they need to look past the skills and hire the talent that has the potential to grow. The ability to adapt to the future needs of business, a positive attitude towards change and an urge to succeed cannot be overlooked with some laundry list of skills set. You have heard it many times that it is all about asking behavioral questions. But it can be tricky sometimes. Especially when you deal with an ‘interview-trained’ candidates who know what to say, how to say it and how to impress you. They might be good in interviews but they might not be a good job performer when they are put under real job circumstances with other team members. So know what you are looking for and frame your questions around it. Are you looking for someone who can collaborate with diverse team or someone who can represent your award winning customer service? Know what behaviour really matters for someone to succeed in your organization and for a particular role. Ask a question on how he responded to specific tough situations and continue to probe furthermore on what he says. One story to another, one experience to another, you should be able to dig deep into his past behavior in various situations. Figure out if his past behavior is an accepted behavior in your organization and in line with your organization’s values. Asking the right questions that unfold the behavior of a candidate can help you understand if he holds some of the personal values that are similar to the organizational values. “I see dead people”. At work. Duppies, zombies, ghosts, whichever term you prefer. People who are there but not really there…or are they? (Cue spooky music…). 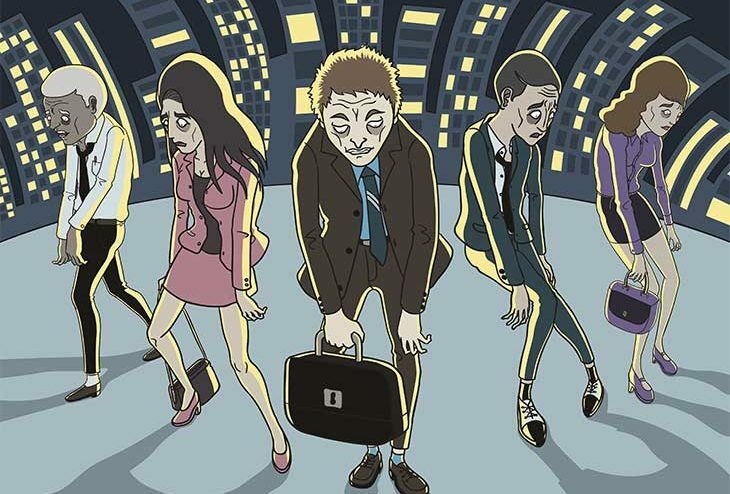 Workplace zombies are those who are disengaged from their companies and their jobs, but still show up for work. They clock-in and clock-out. Present in body but not in spirit; listlessly satisfying the requirements or ‘letter’ of the job, but avoiding any spirited connection with the company’s purpose, mission and people. They were once ‘fully human’, bringing their energy, ideas, and genuine loyalty to their place of work and teams. So what happened to them? What force sapped the life out of these formerly productive souls? This sentiment is voiced by workers who held the company in high esteem when they first joined the organisation. Over time, however, an event or series of events occurred in which the employee’s high expectations were not met. For example, a manager fails to respond fairly or compassionately to an employee’s legitimate personal crisis or need. The employee disengages, emotionally, but due to the monetary rewards, continues to show up to work. Here, the employee accepted the job, and after some time, discovered that it does not fit his/her natural abilities and expectations. Due to the unavailability of a ‘better’ job, the employee disengages, mentally, but continues to show up to work until a new opportunity, or funds to attend training for the new opportunity, presents itself. Here, the individual believes that the pay received is not commensurate with the work performed, so in short, they are being ripped off. Disengagement occurs and ‘another one bites the dust’. Why should companies care about zombie-ism or seek to combat it? Because it costs them, literally! Several studies have shown that disengaged workers, similar to sick workers (google “Presenteeism”), who still come in to work perform at a slower pace, make more errors, and negatively impact the productivity of their coworkers. The net result is that the company would be more profitable if both sick and disengaged workers stayed home until they were well, or resurrected! The discussion on workplace zombies continues this week as the Jamaica Business Development Commission hosts its annual Employee Engagement Conference, an event where hundreds of Jamaica’s CEOs and decision-makers meet to discuss the causes, impact and responses of having an engaged workforce. According to the Institute of Psychometric Coaching, “Psychometric tests are a standard and scientific method used to measure individuals’ mental capabilities and behavioral style.” These tests, identify if the candidate is a suitable fit for the role that they are applying for. Employers will use psychometric tests to identify specific attributes of the potential employee that would have been hard to determine from a face-to-face interview. There are many why employers will choose to use psychometric assessments. Here are 4 of the top reasons. The main benefit of using psychometric assessments is to ensure that you are hiring the right person for the role that you are trying to fill. Psychometric assessments add a measure of standardization and objectivity to the recruiting process that would assist in removing the unconscious bias that is present in the selection process. The results of the psychometric assessments are generally easy to read using simplified and the employer can easily go through the results to gain information about the candidate. Help to boost the company reputation. Employees are attracted to these modern recruiting practices as they will give each applicant a fair and equal opportunity for the role. As such, the employer is able to attract top talent. HR relies on a number of different inputs to make decisions with company-wide effects. Psychometric tools can be used an objective data point that can assist in shaping the HR strategy. 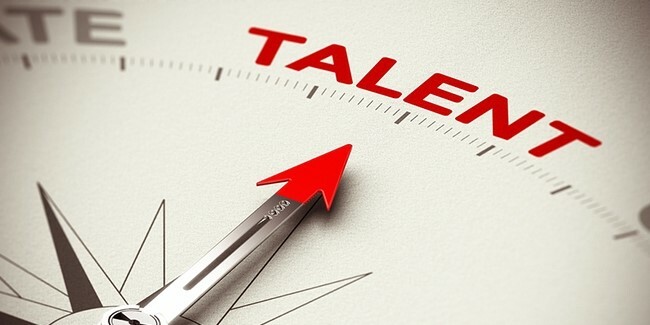 When it is coupled with the individual job performance information, the psychometric test results can be indicators to help companies with selection, talent management, assessing workforce capability, employee engagement, understanding organizational culture and succession planning with a high degree of confidence. 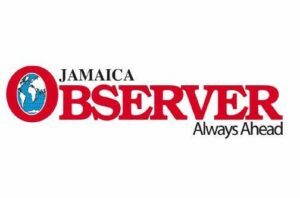 Looking for ASOs in Jamaica? Contact us at 1-876-971-7632 or email us at sales@caribbeanhrsolutions.com. On Friday, September 21 we celebrated Business Women’s Day… well, hopefully at least some of us did. It was an opportunity to celebrate the value female leaders bring to the world of work, especially considering the powerful legacy of lady leadership (the Triple L factor) woven into the fabric of Jamaica’s heritage. But what’s the difference in lady leadership? And what makes it special? 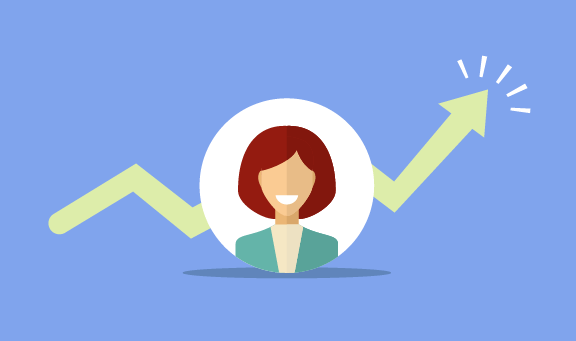 Though the impact is wide, let’s take a look at just a couple of ways boss ladies impact business from the HR and engagement perspective. 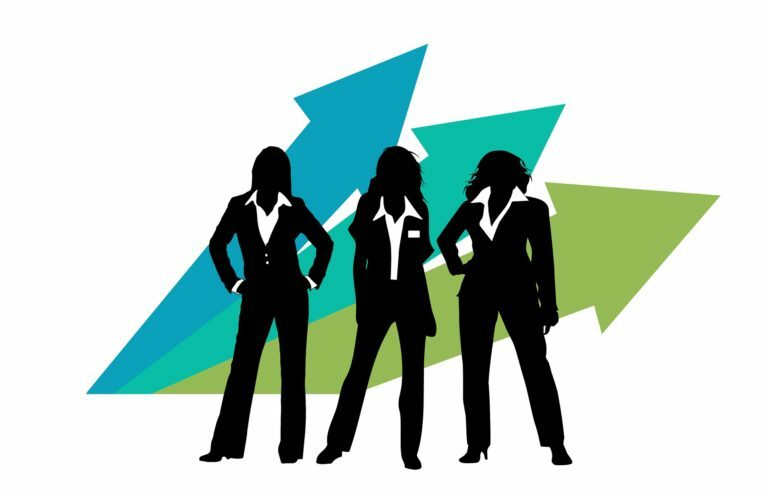 Women have a powerful influence on workplace cultures. A 2017 study indicates that companies with a higher number of women in leadership experience benefits in two key areas: employee engagement and employee wellness. In the case of the former, it showed that employees in companies with a higher percentage of women gave higher satisfaction ratings on several items related to job satisfaction, organisational dedication, and employee engagement. In the case of the latter, the survey indicated that employees in companies with female bosses felt more supported and experienced less job-related burnout. In recognition of Business Women’s Day, I’d like to practise self-awareness and reflect on a few of the special businesswomen who, over the years have figured out how to engage me. As it goes with women, it is likely that they may not be aware of the profound and practical impact they have had on someone else’s life, so let’s hope a little recognition will go a long way. Big up, Lindsay Mohan, my college instructor whose individual attention, gentle prodding and hand-holding turned me around from being an underachieving student to a forever honour-roller. Now that’s engagement! Big up, Emily Hodgkinson, my first manager who gave me a chance to practise HR in spite of the fact that I had only a few HR courses under my belt, and then created space for me to stretch my wings. I am your lady leadership legacy! Big up, Betty Lawrence, whose consistent priority of service to God and community impact inspires her work and mine. Thanks for opening the YES youth centre and for the opportunity to volunteer with you! Big up, Holly Lynch, HR executive in the US, who showed me what a combination of a high IQ plus business savvy compassion+ class looks like in a female executive. And biggest-big-up to Gladys Fraser (my mom) who, as a working mother and first lady now turned ordained pastor and businesswoman, modelled the grace and rewards of “banding your belly” so that other bellies could be made full. Is there a woman who has made an impact on your work life and career development? It’s not too late to call and big them up! After all, that’s what Business Women’s Day is for. What should I put in my employee handbook? In our previous article, we looked at why should I create an employee handbook. This week we want to look at what should be included in an Employee Handbook. Introduction – Begin the handbook by describing your company’s history and business philosophy. Hours – State the normal working hours for full-time employees, rules for part-time employees, and how overtime compensation can be authorized for those entitled to it. Pay and salaries – Be clear on how you set pay and salaries and how you raise them. Also, explain any bonus programs. Benefits – Explain the rules relating to benefits, including vacation pay, sick pay, unpaid leave, and so on. For programs run by an outside provider, such as health benefits, other insurance benefits, and retirement benefits, refer employees to the official plan documents that explain the rules. Drug and alcohol abuse – Many businesses have a policy prohibiting employees from using drugs or alcohol in the workplace. Some require drug testing; some offer to help employees deal with substance abuse through counseling or employee assistance programs. Include this information in your handbook. Harassment – Use your handbook to remind employees that sexual and other types of harassment are illegal and violate your policies. Let them know that you will not tolerate unwelcome sexual comments or conduct and that you will treat any complaints of harassment seriously. Specify how and to whom an employee can complain of harassment, what procedures you will follow to investigate complaints, and what actions will be taken against harassers. Attendance – Emphasize the importance of good attendance and showing up on time. Explain that numerous unexplained absences or repeated tardiness can be a basis for disciplinary action or even firing. Discipline – Explain the types of conduct can get employees in trouble — for example, theft, violence, repeated performance problems, or fighting. Be sure to let your employees know that this is not an exclusive list and that you always reserve the right to decide to discipline or fire an employee. Employee safety – State that employee safety is a major concern of your business and that employees are expected to follow safety rules and report any potentially dangerous conditions. Complaints – Let employees know what procedures they should follow to make and resolve complaints. Designate several people in the company to receive employee complaints, and state that there will be no retaliation against any employee for filing a complaint. Having — and enforcing — a written complaint procedure can help shield your business from liability if an employee later sues for illegal harassment or discrimination. Electronic communications – Include your company policies on use of email, the Internet, social networking sites, blogs, and so on. Because you may have to read employee communications (for example, if one employee accuses another of sending harassing email), your policy must tell employees that their communications may be read and are not private. If you monitor employee communications, say so. Workplace civility – State that employees at all levels of the company are expected to treat each other with respect and that the success of the business depends on cooperation and teamwork among all employees. Do you have a company handbook? Have you reviewed it recently to ensure your policies are updated? 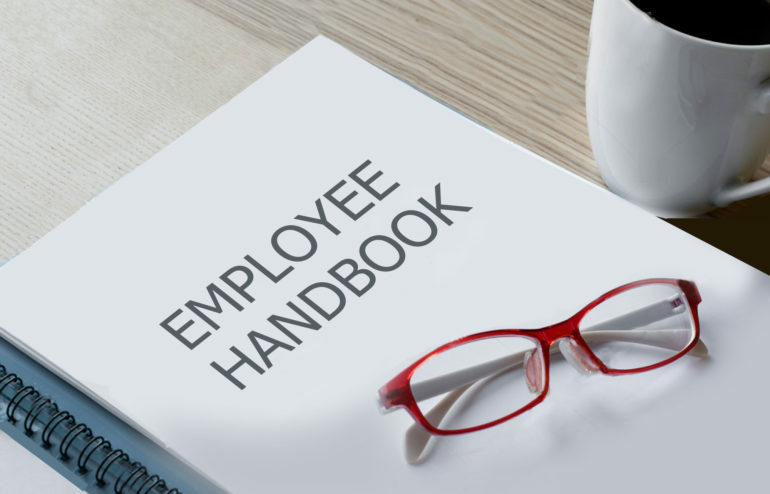 Do you need help creating an employee handbook? 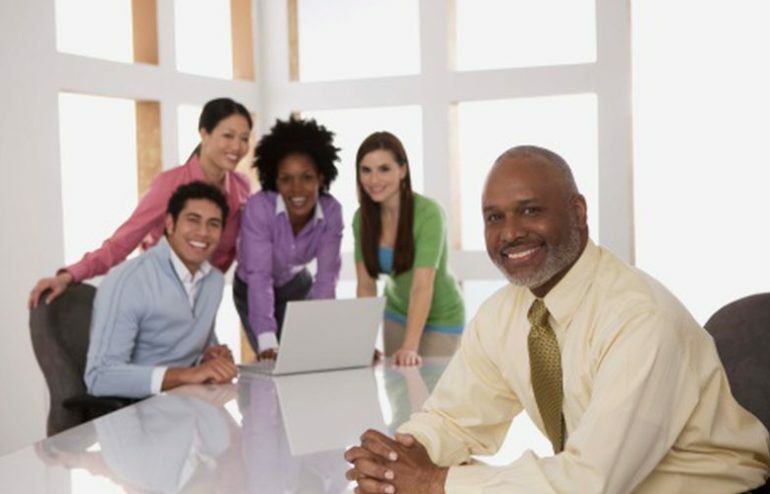 Caribbean HR Solutions is Caribbean’s premier HR Outsourcing company providing your HR needs. Email or Call us today for assistance with updating or creating your employee handbook or any other HR related service. Contact us at 1-876-971-7632 or sales@caribbeanhrsolutions.com. In last month’s issue, we identified that: “The average person would rather have a great boss looking out for them than prizes, trinkets and parties”. 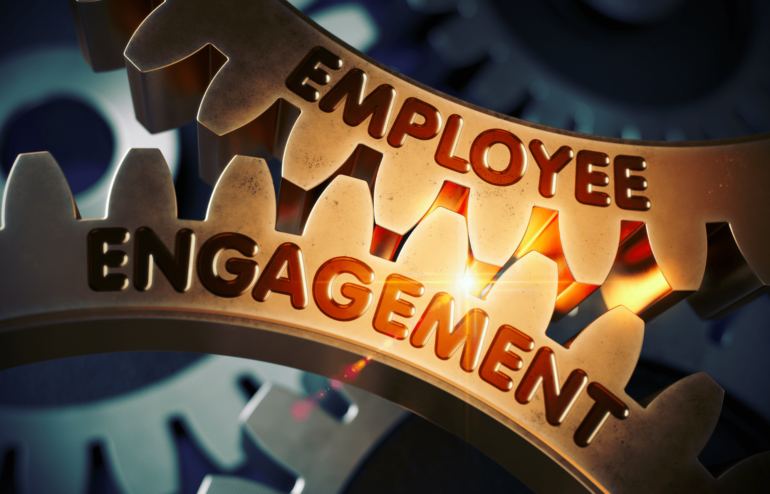 Improving productivity is directly linked to employees’ engagement with… their boss! So, if you are a leader who is cognisant of the power of your role and who wants to make a difference, what is the single most important thing you can do to ensure you are part of the solution, and not the source of the problem? Unsurprisingly, many ‘bad bosses’ actually believe they are fantastic leaders. The problem is, they are significantly disconnected from their employees’ perception of them. Remember Psychology 101: the Johari box? Created by two psychologists in 1955, this theory is a technique that helps people better understand their relationship with themselves and others. 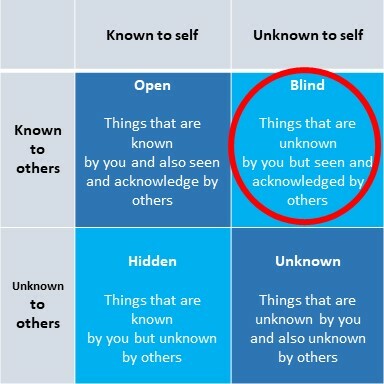 Each person’s self-awareness falls into four quadrants, as per the image below. The challenge “terrible” bosses have is that much of their interactions fall in the “Blind” box. For example: during the busiest time of the day a manager appears on the production floor, shouting work-hard mantras meant to ‘encourage’ staff to hit their goals. He believes he is showing support for the teams ‘in the trenches’. Meanwhile, his staff perceives his ‘ranting’ as annoying, distracting and part of his typical ‘hands-off’ approach. The result? Staff absenteeism increases during peaks, productivity goals are missed, and there is unwanted turnover. Imagine the improvements in productivity and employee engagement if that manager were aware of the impact his approach had on his staff, instead of acting out of the blind box where everyone (including the company purse) loses! But whose responsibility is it to make the manager aware? Is it the manager’s? Human resources’? The staff’s? Newsflash: staff will rarely volunteer feedback to their boss for obvious reasons, unless the leader genuinely solicits it and creates a safe environment for staff to share. Leaders: Asking staff for feedback on YOU is the most important thing you can do to increase your own self-awareness and leadership effectiveness. 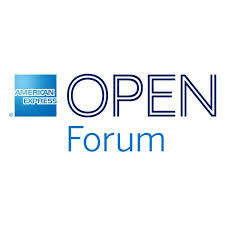 This week’s challenge: Ask your employees: “On a scale of 1-10, rate my leadership style.” Solicit the presence of a human resource representative to make it a ‘safe space’. Ensure you LISTEN and avoid any statement of self-defence. Then, each time you receive a rating lower than eight, ask the follow-up question: “What would I need to do differently to make that number a 10?” Don’t wait for your company’s annual employee satisfaction survey to show you up. Take the initiative to find out where your gaps are and then address them. In this way, you will have better served yourself, your staff, and your company. Until next time, leaders keep lookin’ up!